Create a custom design or use an existing template when creating your tax folders and report covers. From small document holders to large presentation folders Dataguide can provide a tax folder that works for you and your clients. If the folders on this page don't meet your needs click on any of the folder pages seen in the right, side bar navigation menu. 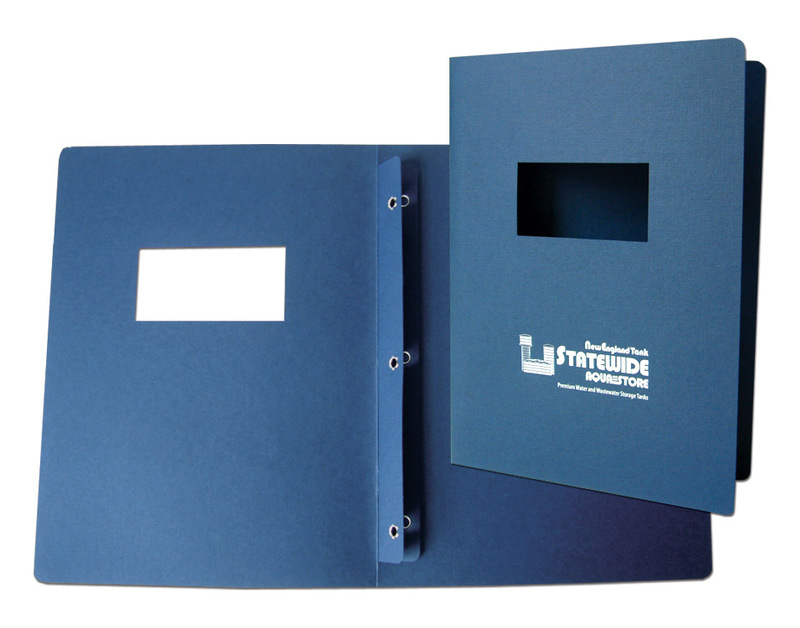 Any of our presentation folders or document holders can be customized to create the right tax folder for you and your clients. 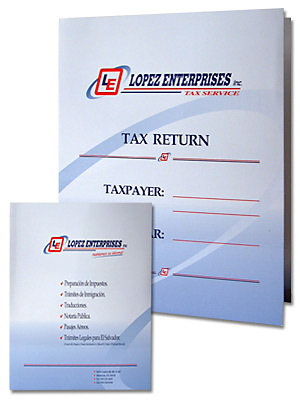 Custom tax folders are a great option to stand out and remind your clients of your services. Create your own custom tax folder to promote your professional image. Use a custom tax presentation folder to help your clients stay organized and provide a constant reminder of the professional services you've provided. A double pocket folder is perfect for organizing and separating the return that must be filed from the clients copies, instructions can be printed on each pocket telling the client exactly what to do with the documents in each pocket. Use the custom tax folder to promote additional services available from your firm, it's a perfect way to remind clients of other services you can provide. 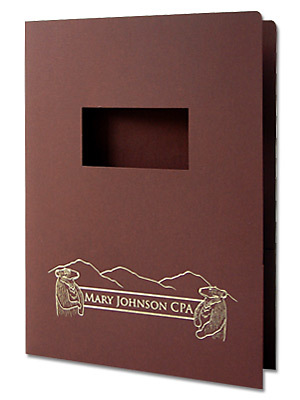 If a custom tax presentation folder makes sense for your organization there are numerous design options you can choose from to match your professional image. Numerous paper stocks are available, choose a glossy finish or a linen paper with foil stamping of your logo. Adding a cut out window is a great way of highlighting the client information seen on the inside pages. Including a spine allows you to secure the important documents inside the tax presentation folder. The documents can also be filed in the desired order for easy organization. Order your custom tax folder with the standard white spine or when available, match the spine to one of the standard stock colors. Be sure to indicate your choice when placing your order. If a single pocket makes more sense for you choose either a left or right pocket and us the side without the pocket to include detailed instructions, or promote additional services.